Tennant’s general cadence is a calming one, which may be why he’s so captivating as Kilgrave. The purple-suited villain’s superpower — the ability to make anyone in his presence do whatever he says — makes him incredibly dangerous and unbelievably compelling. Reached via phone, Tennant spoke with Indiewire about how he got involved with the Marvel universe and whether or not there’s really a difference between playing the hero and playing the villain. So, congratulations on the release of [“Jessica Jones”]. Have you been surprised by the reaction it’s gotten? Well, listen, I knew that it was good and I was proud of it, but there’s always that bit when you’re going to send it off into the world [when] you just don’t know if it’ll click — whether people will respond to it the way you hope they will and whether people will even notice. There’s so much stuff out there now and so many different ways of receiving it, it’s quite hard to punch through. I suppose we had the advantage of being a part of the Marvel stable, which comes with a certain spotlight attached, but then coming after “Daredevil,” which had been such a smash hit, we were a little nervous that we couldn’t live up to that. But the response has just been quite overwhelming really, from friends who’ve watched it to strangers who’ve let me know how much they’ve enjoyed it. Obviously, I’ve been doing a lot of talking to people like yourself, and it would seem that people in the industry are genuinely loving it as well, so the response has been everything I could hope for. I’m delighted. It’s funny because I heard that you were originally approached years ago to potentially play this character. Is that correct? No, no. It all happened not long before filming began. I got approached at the end of December last year and we were shooting in February. I’d heard that they were perhaps tracking me a little bit — I was under option to various other things, options which then lapsed which then allowed them to approach me. I believe that there might have been a bit of that going on — but I was blissfully unaware of anything until about six weeks before we started shooting. When they first came to you, what was their pitch? Then I spoke to Melissa Rosenberg, our showrunner, and I spoke to Jeph Loeb, who’s the head of Marvel Television and they sort of pitched the rest of the show and roughly where it was going to go. They talked about what the character might do, I got sent a couple of scenes from later episodes; draft scenes to give me a flavor of what the character might be like when he actually showed up. That was all very intriguing and very exciting because from the two scripts I did read, I could tell it was great writing and that it was going to be something special. But it was a bit of a gamble, if I’m honest. I didn’t really know what I was letting myself in for. But I just think that good writing is the thing you always chase. Storytelling that makes you want to come back for more. So when that presents itself, you kind of think it’s a bit of a gamble, but it’s probably a gamble worth taking. Do you happen to remember anything about the scenes that you were sent? You mean which ones they were? Ah, which ones were they now? There was definitely the scene where Kilgrave first meets Jessica, which is a flashback, obviously — the scene where he meets her in the street. God, what else? There were some things that were in embryo as well that ended up being written and went in slightly different directions, so I can’t remember exactly which ones they were, but they were from later in the series, certainly. One of the things that’s so interesting to me about acting is the idea of knowing, as an actor, what kind of power just in general your character has in the world. I’m wondering for you, how did approaching that affect you in building Kilgrave? Well, it’s a fascinating thing to be handed, isn’t it, this mind control number? Because at first, you think that’s quite a rather splashy, kind of comic book idea, but inhabiting that becomes fascinating actually. Just in terms of what that would do to you and to your worldview and how you would cope with that, if that was something that you were blessed or indeed cursed with. It’s sort of a wish fulfillment thing, isn’t it? The idea that everyone should bend to your every whim and that no one should ever contradict you, that you can have whatever you want whenever you wanted it. It’s rather aspirational and rather desirable at first glance, but the fact of it is then rather horrifying, because you could never have a genuine human relationship with anyone. You could never calibrate how people were responding to you or how they felt about you because you’ve forced them to acquiesce to your every desire. So then, of course, that starts touching on what kind of personality that would create, what kind of person that would make you, how that would pollute your worldview. It was a fascinating character actually to try and build a reality for and to try and make sense of. On one level, it’s great fun because you get to play these scenes which are hilarious and extraordinary and everyone in the room does whatever you say. It’s a weird, rather intoxicating thing, but you’re also then increasingly aware of how damaging that would be for your psyche and clearly with Kilgrave, it’s not left him in a particularly good place. I think one of the most extraordinary things about the season is the stretch of episodes that really digs into the vulnerability of Kilgrave. Yeah. Well, he’s had a terrible, awful time and this extraordinary ability that he has, it is really a sort of King Midas story. What seems like a truly magical power does become a curse for him and does mean that he can never have a normal life and he can never relate to anyone on a really intimate level. And of course, that’s what he’s actually craving with Jessica, but he can never have it. And it wasn’t even something he asked for. It was kind of thrust upon him. No, quite, quite. Yes, and clearly he hasn’t covered himself in glory with the choices he’s made since, but then you start to think, who would, actually? Who could genuinely say they would have that power and not be corrupted by it? The more you think about it, the more fascinating it becomes, I think. I think what makes the show so profoundly affecting is the way it really embraces portraying trauma — because every character in that show is dealing with it and also inflicts it. Quite. Yes, Kilgrave is the classic character who is abused and therefore perpetuates abuse. It was just a terrible, horrible cycle. The fact of that, people who’ve had awful trauma visited upon them that they often will visit it on others. Yes, I think Melissa Rosenberg managed some fairly profound insight. Even within this fantasy world, it talked about lots of really live issues and it talked about them in remarkably sensitive ways, I think. That’s interesting. Clearly, that’s what Kilgrave thinks. Jessica does not think that, or if she does, she’s certainly burying it very deep because she doesn’t want to admit that. I think what I liked about the show is that it allowed all those ambiguities in, and it allows an audience to not be entirely sure who they are rooting for at any given moment. They know who they should be rooting for, but I think it keeps confounding your expectations in that way. I think it’s one of the great strengths of it. Have you seen any real world changes to how people react to you after playing this? [laughs] I don’t think so. Not yet, but I don’t know. I think that maybe people wouldn’t share those with me anyway. It’s probably polite of them. Yes, quite. I suppose that if people were in some way nervous of me because of my association with that character, they might just avert their gaze and move on. I don’t know. What’s so interesting about looking at your resumé in full is that you’ve always taken on such a diverse range of projects. Well, I’m re-rehearsing a play at the moment. I’m working with the Royal Shakespeare Company doing “Richard II,” which I did a couple of years ago. We’re re-rehearsing that to put it in with a sort of sequence of Shakespeare history plays in London and in New York. Stagework still feels like my day job, really, because that’s where I started. Although I probably spend more time filming these days, I always feel like I’m going home a bit when I do a play. So I’ve got that coming up and then there’s a film that I think is going to happen, although I’m always a bit nervous about relying on them until you’re there. Then, I’m doing another season of “Broadchurch,” which I’ve done a couple of times now. But again, it’s quite a varied bunch of stuff, which I continually feel very fortunate to get to keep mixing it up. It’s all I ever hoped to do, really. What’s different for you about going from a first season show to then going back to “Broadchurch” for a third season? It depends on the show, it depends on the people. I mean, “Broadchurch” is an incredibly happy bunch. It’ll be enormously good fun to be back in amongst that bunch of people, and it’ll be a show that we’ve all come to love, working with Chris Chibnall’s script, which is high-quality stuff. It’ll be nice to be back doing something that I’ve had such great experiences with in the past. I suppose it’s different, returning to a character. There are great advantages to that because you know you’ve got a sure hand with the people that you’re working with. It’s nice to be able to go back to something that you feel comfortable within because then you can sort of hit the ground running in a way that, if it’s a new show, there’s all that sort of negotiation of what you’re trying to achieve and who you are and the people you’re working with. That’s very inspiring, too. It’s just different. And like I say, the variety of types of things and frequency of things is something that I feel very lucky to get to enjoy. I mean, you’ve gotten to play really remarkable heroes and really remarkable villains. Sure. Then, lots who are somewhere in the middle. 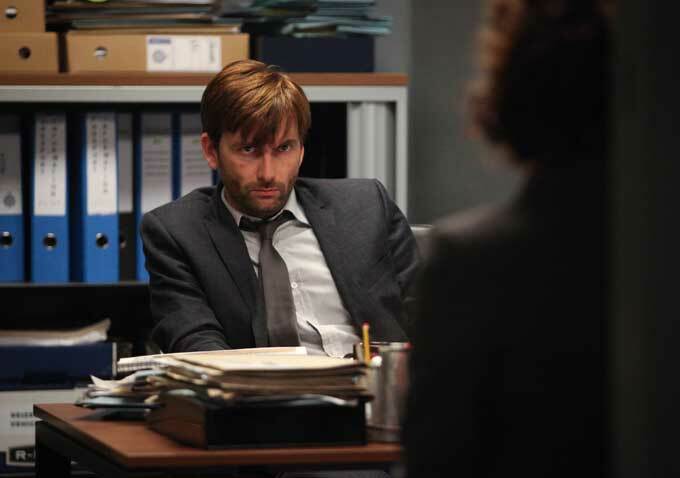 Alec Hardy in “Broadchurch” for instance, I guess he’s the hero of the piece, but he’s quite a dislikeable chap at times, as well. That’s quite a nice line to try to tread. What’s the trickiest? Being the hero, being the villain or being in between? I think the tricky bit is making any of them real. The tricky bit is not letting anyone be defined by hero or villain or whatever else it might be. It’s finding the nuances that make it a recognizable human being, rather than someone who’s defined by the hole they fill in the story. That’s when I think characters come alive, rather than fulfilling their plot requirements. 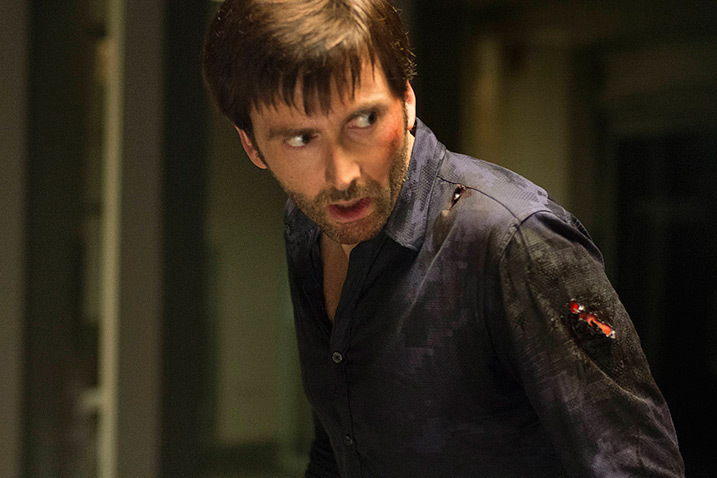 “Marvel’s Jessica Jones” Season 1 is streaming now on Netflix.